Thematic.. cross-curricular.. arts-rich.. fun! Dimensions offers fantastic, creative curriculum development resources and training support packages at great prices! Science Learning Centres are a national network for professional development in science teaching. Their aim is to improve science teaching and to inspire pupils by providing them with a more exciting, intellectually stimulating and relevant science education. The Children's University is a national organisation that provides 7 to 14 year olds with exciting and innovative learning activities and experiences outside normal school hours. They celebrate achievement and reward participation through their certificates. Academy Of Sports is a professional and unique coaching company that prides itself on delivering simply the best sports provision, where every child matters. In conjunction with schools and their partners, they aim to develop a healthier future. ExpoChef's flexible, dynamic and professional approach is second to none, and has been a major factor in delivering the Food in Schools aims and ojectives. "ExpoChef demonstrations are energetic and inspirational, because they engage the young people and parents during the proceedings and leave participants with recipe booklets and access to the website." 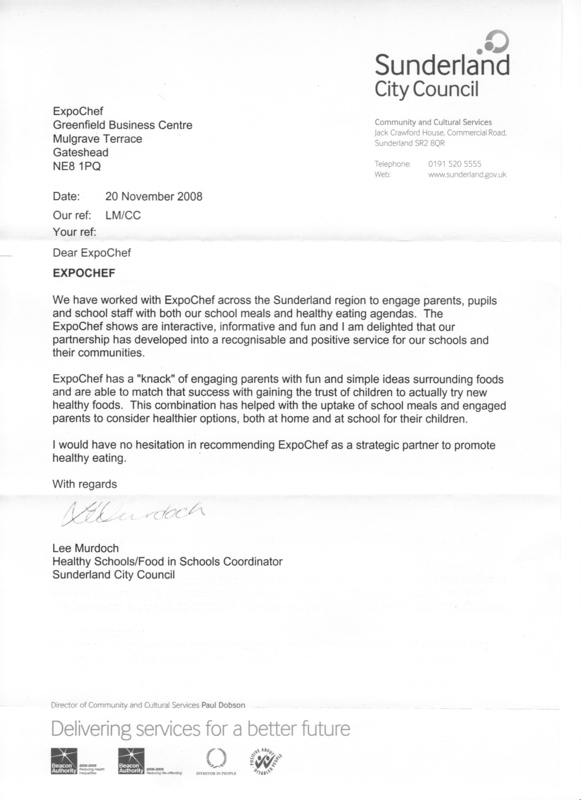 "An excellent partnership between Redcar and Cleveland Healthy Schools and ExpoChef was established from day one. ExpoChef is a professional, efficient and effective team and are always a pleasure to work with." “Durham County Council has worked in partnership with ExpoChef for almost four years now and I can say they have delivered every time." ExpoChef road shows are a great way of delivering healthy eating messages to students, staff and parents, engaging them in thinking about how they can make simple changes to their own diets. "I have watched The Food education Company grow and develop over the years into a valuable service for the local community. The Food Education Company has changed people's perceptions about healthy eating. They have inspired our customers to make lifestyle changes towards a better and healthier future." Angeline Brown, Job Centre Plus - Pathways to work. "Inspirational education for health and wellbeing"
Copyright © 2013 The Food Education Company. All rights reserved.